Don’t miss a chance to visit this market town. You’ll see medieval streets, old English churches and tiny twittens (a Sussex word for alleyway) . Although surrounded by chalk cliffs, the town is dominated by the remains of a 1000 year Norman castle (seen in my photo). Panoramic views are guaranteed if you climb to the top! The adjoining Barbican House is home to the Museum of Sussex Archaeology with local collections from the Stone Age to medieval times. A mini-cinema tells the story of Lewes from prehistoric to Victorian times. The town also has many contemporary art galleries and historic & special interest sites including the Priory of St. Pancreas – a former monastery. You’ll come across numerous small, specialist, independent retailers and a local brewery. I recommend visiting Cliffe High Street. Bookshops, boutiques and antique shops are there as well as individual craft workshops. You’ll also find restaurants, cafes, and pubs offering tasty choices all year round with an emphasis on local produce. Lewes is one of my favourite towns. I recommend a visit! It is 7 miles from Brighton & a 30 minute drive from Steyning. 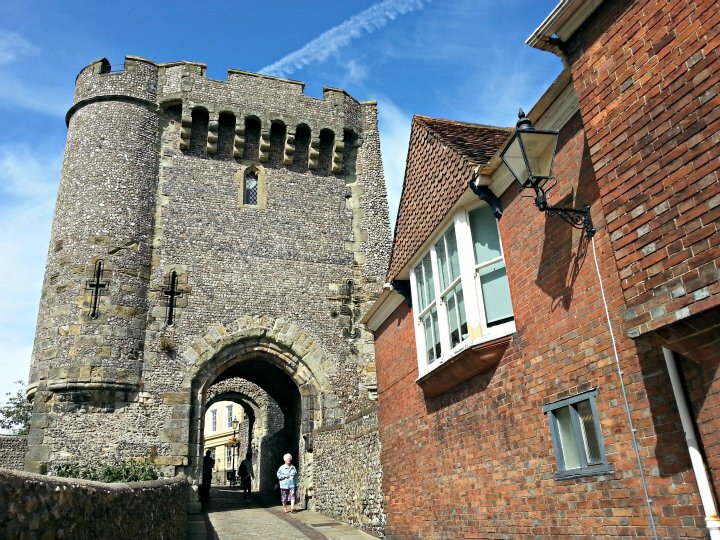 You can also reach Lewes by public transport.